Having quick access to connectivity settings like WiFi, Bluetooth, Data and GPS isn’t available on mobile operating systems like iOS (unless you jailbreak) or Windows Phone 7, but we came across an interesting app today – for Windows Phone – that allows users to place different network toggles on their homescreen in the form of tiles. Developed by Purity Networks, Network Dashboard lets users take a quick glance at what connectivity settings are turned on while allowing users to pin tiles for each setting to the homescreen. Setting it up is very, very easy. Once you have downloaded and installed it, all you have to do is launch the app, hold one of the four toggles and then pin them on your homescreen. After you have pinned your desired toggles, changing WiFi/Data/Bluetooth and Airplane Mode on to off (and vice versa) becomes a one-tap business. 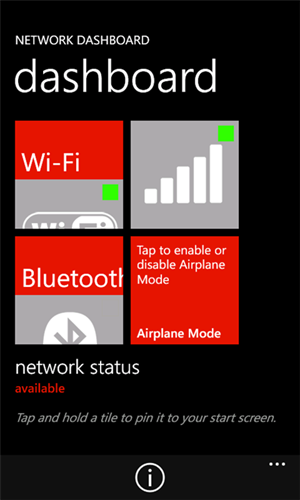 Network Dashboard provides a quick, at a glance view into the network status on your Windows Phone. Tap on a tile and you can quickly change the settings. Tap and hold a tile and you can pin it to the Start menu for quick and easy access! We have personally tested Network Dashboard on a HTC 7 Trophy running Windows Phone 7.5 Mango and can confirm that it works as advertised. 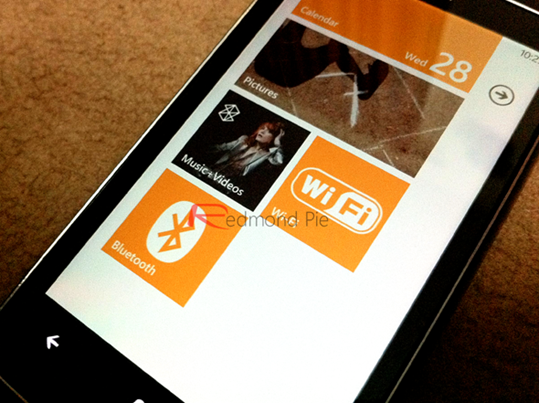 The app is completely free but works exclusively with smartphones running the latest release of Windows Phone 7 i.e. Mango. Mango is still sometime away from seeing a complete roll-out, so we suggest you follow our guides (linked to at the end of the post) to upgrade to Mango before you install Network Dashboard. If you’re interested, Network Dashboard can be downloaded from the link embedded below. It is a free app, so there really is no harm in giving it a try. Do let us know of your experience with it in the comments section on our Facebook page. Be sure to check out our Windows Phone 7 App Gallery to discover apps for your Windows Phone.